UNB, Munshiganj, 31 January : A policeman died and 30 people including 20 police personnel were injured as Bangladesh police clashed with villagers who protested the government plan to build an airport that may take away their lands. 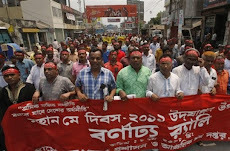 Witnesses said thousands of villagers armed with sticks and brick-chips put barricade on Dhaka-Maowa highway protesting the proposed Bangabandhu International Airport. Police fired rubber bullets and used tear gas shells to disperse the agitators. 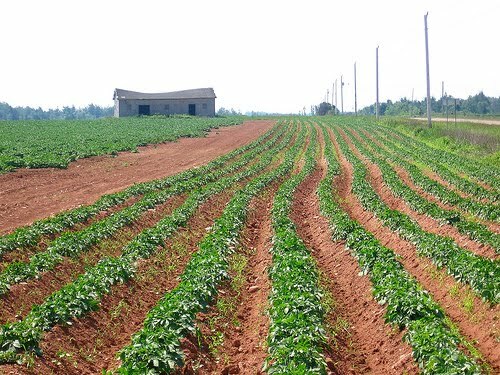 To build the international airport, the government has started acquiring land but villagers say they will lose homes and croplands. 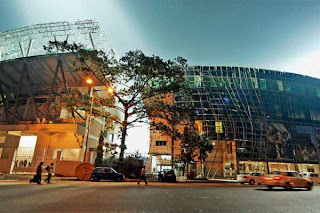 Kolkata, New Delhi, 31 January : The ICC today approved BCCI's proposal to hold the India-England Cricket World Cup tie at Bangalore after Eden Gardens was stripped of the right to host it and said the match will be held on the scheduled date of 27 February. 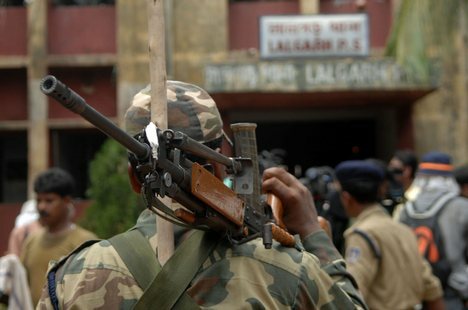 Agartala, 31 January : An official of National Building Construction Corporation (NBCC) was today shot dead by rebels of outlawed NLFT and his driver injured at a remote tribal hamlet near the Indo-Bangla border, police said. SP (Police control) Tushar Kanti Das said a group of NLFT ultras from inside the Bangladesh side of the border opened fire at the jeep in which C N Muni, in-charge of Shewapara border fencing site of NBCC in North Tripura district, was travelling this afternoon. 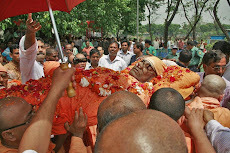 Muni died on the spot while driver Narayan Roy was admitted to Kanchanpur sub-divisional hospital with injuries. PTI, Kapurthala, 31 January : To combat Maoist problem in West Bengal, 200 young recruits of Kolkata Police underwent a six-month basic training from the Punjab Armed police here. The policemen, who completed the training, will be put on VVIP security duty and given special assignments, Kolkata Police Senior Deputy Commissioner S K Gazmer told reporters on the sidelines of their passing out parade. 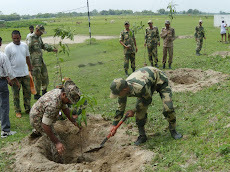 He said the West Bengal government was raising a combat battalion and these recruits would be given assignments in this battalion after a six-week rigorous commando course. 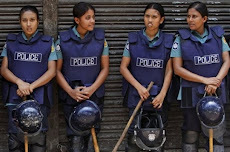 Dhaka, 31 January : UK Border Agency enforcement operations have arrested 47 Bangladeshi nationals for working illegally in the UK in December and January. Besides, in Scotland a Bangladeshi man has been jailed for 16 months this month for facilitating the unlawful entry of migrants to the UK, a release of the British High Commission here said today, adding he will be liable to deportation on release from prison. The 46 Bangladeshi men and one woman were found with other nationalities working illegally in widespread enforcement operations in England, Scotland and Wales over two months. 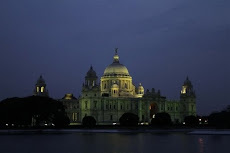 Kolkata, 31 January : A city court today upheld the order of a lower court reframing charges to include the more serious abetment to suicide against the principal and three teachers of La Martiniere School in the case where a student had hung himself after being caned at the school. 13-year-old Rouvanjit Rawla had been found hanging at his residence on 12 February last, four days after being allegedly caned by Principal Sunirmal Chakravarti for misbehaviour and disobedience. 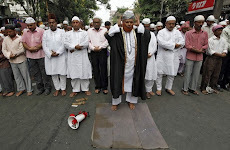 The chief judge, city civil court, Kolkata, Dipak Saha Roy, rejected the prayer of the four teachers and upheld the order of a metropolitan judge to try them under more serious charges than those earlier framed by the police. Rouvanjit's father Ajay Rawla said he was "happy" to hear the judgement. PTI, Imphal, 31 January : Police have seized arms and ammunition from the Wabagai Makha Leikai area in Thoubal district, official sources said today. The police commandos seized three AK-56 rifle, one WGb rifle, two M-16 rifle, one 303 rifle, two M-23 rifle, some magazine and ammunition from the area last night during a raid, the sources said. UNB, Sylhet, 31 January : A special court here Monday convicted 61 BDR jawans and sentenced them to different jail terms in BDR mutiny case. 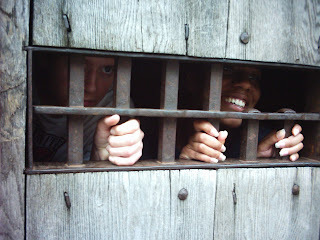 Among the convicts, six were awarded seven years imprisonment while the others get different terms of imprisonment. The Special Court-14, headed by Col SM Farhad, also fined the convicts Tk 100 each. The three-member court also included Lt Col Akhtaruzzaman and Major Mohammad Maksudul Alam. Kolkata, 31 January : RPG Group company Phillips Carbon Black Ltd (PCBL) will persist with its bid to acquire Germany-based Evonik Industry, world's second largest carbon black maker, its top executive said here Monday. "Is it an opportunity (Evonik acquisition) that you should let go off," RPG group chairman Sanjiv Goenka said while talking to reporters here Monday. New Delhi, 31 January : CPI today alleged that both BJP and Congress were on the same page on "saving" those having black money stashed abroad and demanded that the government should insist on an international pact forbidding deposits from any country with the intention of cheating the other. 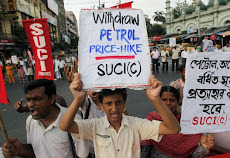 In a statement, CPI Central Secretariat said the latest attempt of the government is aimed at making the depositors change their mind and go for voluntary disclosures. 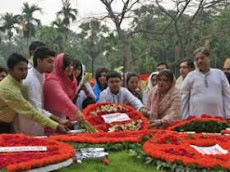 UNB, Dhaka, 31 January : Bangladesh government on Monday decided to propose opposition leader Khaleda Zia to place floral wreath at the Central Shaheed Minar on 21 February under VVIP protection. The decision was taken at the inter-ministerial meeting on security on observance of the Ekushey February and International Mother Language Day held at the Home Ministry with Home Minister Sahara Khatun in the chair. 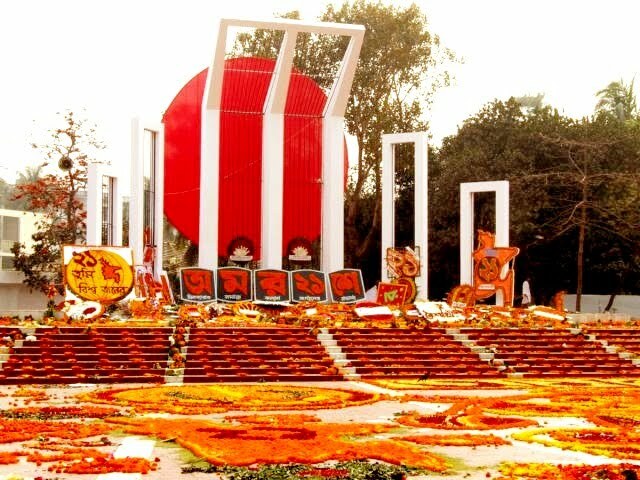 Meeting sources said nearly 8,000 police and 1000 RAB will be deployed in and around the DU campus to ensure foolproof security during the observance of ‘Amar Ekushey February’. 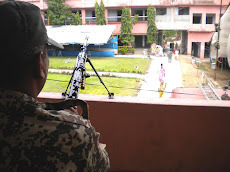 Besides, 24 CCTV will also be set up at different strategic points and sniper dog squad will also be on duty as part of tight security measures. The meeting was told that the strict security measures have been taken keeping in mind of the hosting of the ICC World Cup peacefully. Briefing to reporters after the meeting, the Home Minister said strict security will be in place to avert any kind of unpleasant situation. The meeting proposed consideration of erecting more than one temporary altar alongside the Central Shahid Minar to handle the massive crowd as well as facilitate all mourners to pay their homage to the language martyrs smoothly. Home Secretary Abdus Sobhan Sikder and officers concerned attended the meeting. PTI, New Delhi, 30 January : The ICC has formally conveyed to the BCCI about its inability to hold the India vs England World Cup match at the Eden Gardens on 27 February. 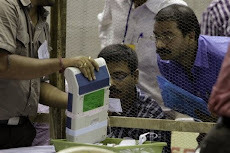 The BCCI issued a release of ICC conveying its inability to hold the match at Eden Gardens on 27 February. 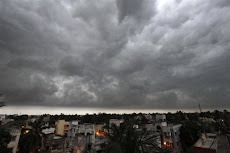 The Cricket Board said it has recommended Bangalore as the alternate venue for the match. "The ICC has conveyed to the BCCI that it will not be able to hold the India Vs England match of the ICC CWC 2011 at Eden Gardens, Kolkata, on 27 February 2011. "The BCCI has recommended Bengaluru as the alternate venue," BCCI Secretary & President-Elect N Srinivasan said in the release. 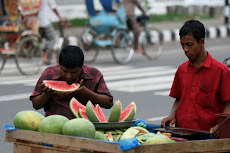 UNB, Dhaka, 30 January : Bangladesh Bank on Sunday announced an accommodative monetary policy for the last six months of the current fiscal (January-June 2011). Dhaka, 30 January : Bangladesh President Zillur Rahman has urged the authorities of all universities to make practical education compulsory in their curricula so the students could acquire knowledge about reality and contribute in the national development. “Activities and tactics will have to be known to all how the bookish education can be applied in our national development,” he said. President stated this while presiding over the 11th convocation of the American International University-Bangladesh (AIUB) held at Bangabandhu International Conference Center in the city on Sunday. PTI, Jaipur, 30 January : Over 250 people led by activist Aruna Roy today courted arrest demanding the release of rights activist Binayak Sen, sentenced to life on charges of sedition. Speaking at the public meeting at Gandhi Circle here, Roy said that "Sen's imprisonment is similar to one of the fascist ways of Nazis where all dissent was denied and people started living in fear." 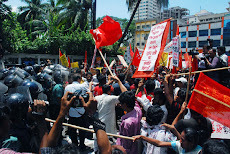 The group, comprising students, workers and trade unionists, also demanded scrapping of the sedition law. 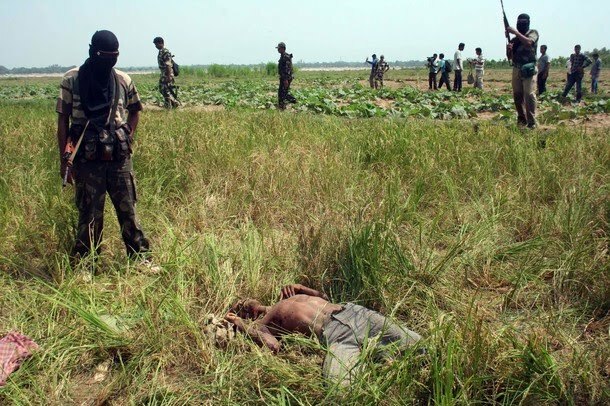 Jhargram, 30 January : The body of a missing CPI(M) activist was found at Jhargram in West Midnapore district today, barely four days after another worker of the party was found dead in the area, with Maoists suspected to be behind both incidents. The body of Hamid Mallik was found from the bank of Kangsabati in Manikpara area of the 'junglemahal' belt, police said, adding the body of Mallik's companion Mohammed Ali, another left activist had been recovered from the area on 26 January. Reuters, Dhaka, 30 January : Bangladeshi company Summit Power SMPL.DH said a joint venture with U.S. group General Electric (GE.N) had signed financing deals for new power plants that will generate 676 megawatts of electricity. Elephant found dead near Dhupguri area in Jalpaiguri dist. Jalpaiguri, 30 January : An elephant was found dead at a field near Dhupguri in Jalpaiguri district this morning, Forest department officials said. The carcass of the 15-year-old tusker was spotted by villagers at the potato field at Garkuta and they informed the Department. 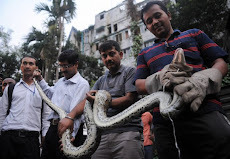 According to the officials, the elephant had probably come from the Sonakhali forest last night to feed itself. It is suspected that the elephant could have died after eating the crops that were sprayed with pesticide yesterday but the exact cause of the death will be known only after the postmortem examination, they added. 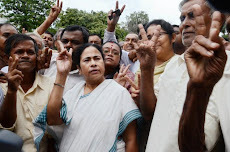 Kolkata, 29 January : West Bengal chief minister Buddhadeb Bhattacharjee today intervened to bring back the India-England World Cup match, scheduled to be held on 27 February, to the Eden Gardens. 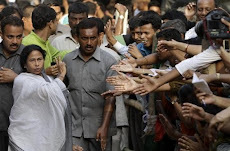 Chief Minister asked two of his ministers to get in touch with the former India cricket captain Sourav Ganguly and put in all possible efforts in order to bring the match back to the city. "The chief minister has said that it is not the time to point fingers at those because of who the match has been shifted from here on the instructions of the ICC. He has urged to put in an all-out effort to bring back the match to Eden Gardens," state sports minister Kanti Ganguly told here. State's urban development minister Ashok Bhattacharya also said that he along with the sports minister and Sourav Ganguly, would meet the ICC chief Sharad Pawar and ask him to plead with the international cricket body to change their decision of scrapping Eden Gardens as a venue for India-England match. 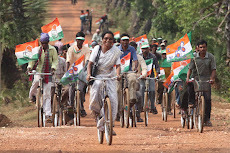 "We have sought an appointment with Pawar and our date of journey will be finalised accordingly," Bhattacharya said. "Since it involves the emotion of millions of cricket lovers of West Bengal, maximum efforts will be put in to see that the match is held at the Eden Gardens. In fact, if necessary, the match might be rescheduled," the minister added. 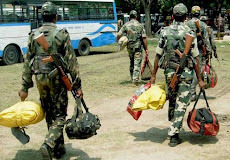 PTI, Kolkata, 29 January : The CRPF today said it has not been able to recover any arms from the camps allegedly run by the CPI(M) in Lalgarh and its adjoining districts of West Bengal. 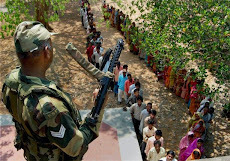 “A list was given to us by the court mentioning the location of armed camps in the three districts (Midnapore, Bankura and Purulia) and we distributed the list to the field officers so that they can conduct raids in their areas,” IG (CRPF) T B Rao told PTI. 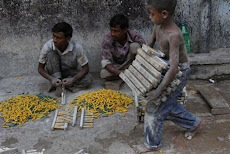 “The raids are being conducted for a week or so but so far there has not been any positive result,” Rao said, adding that by “positive result”, he meant that no weapons have been recovered from the camps. When asked whether they had searched all the camps in the list provided by the court, he said, “No we have not been able to conduct search operations in all the camps, but a considerable number has been searched and there has been no positive result. 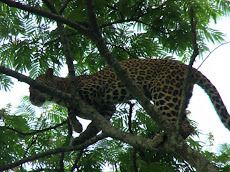 More search operations will continue,” Rao added. 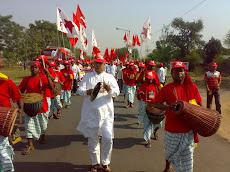 The State government had come under severe criticism when nine people were killed allegedly by armed CPI(M) cadres at Netai in West Midnapore on 7 January. UNB, Dhaka, 29 January : Bangladesh Bank will announce its monetary policy tomorrow at 2pm, said governor Dr Atiur Rahman. 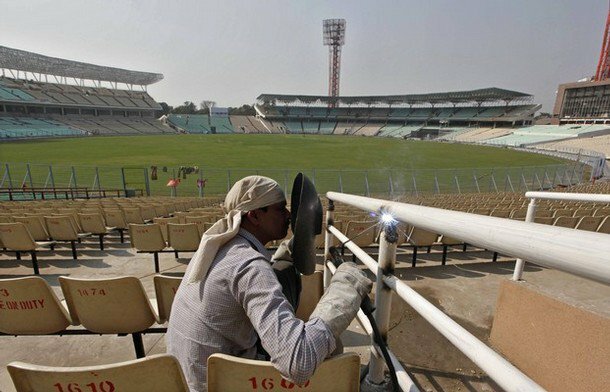 Kolkata, 29 January : Cricket Association of Bengal (CAB) virtually accused the International Cricket Council (ICC) of double standards after the international body Saturday turned down its plea of retaining the historical Eden Gardens as the venue for the India-England World Cup match. CAB joint secretary Biswarup Dey said the ICC has different principles for different venues. "The inspection was done on January 25 and Eden was removed as a venue on January 27. But the rest of the venues got an extension of 14 days. It seems the ICC has different principles for different venues," said Dey. 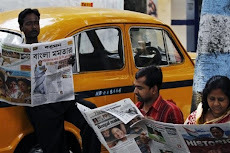 Dhaka, 29 January : Journalist Pathik Saha, two times former general secretary of Dhaka Reporters’ Unity and chief reporter of the daily Bangladesh Pratidin, died of cardiac arrest in the city Saturday morning. He was 45. Family sources said Pathik Saha fell sick at his Lalmatia residence and died on way to hospital at about 5 am. Pathik Saha,also information and research secretary of Swechchhasebak League, left behind one son, wife and host of relatives and well-wishers to mourn his death. 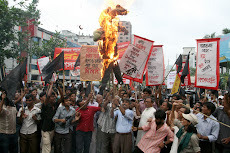 His body was taken to Dhaka Reporters’ Unity premises at 11 am. 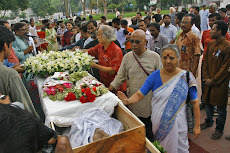 Hundreds of working journalists, political leaders, well-wishers and leaders of social, cultural organizations rushed there to pay their last respects to their departed colleague. Kolkata, 29 January : The “Know Your Army” Exhibition got under way today at Fort William Driving Range opposite Fort William Stadium. 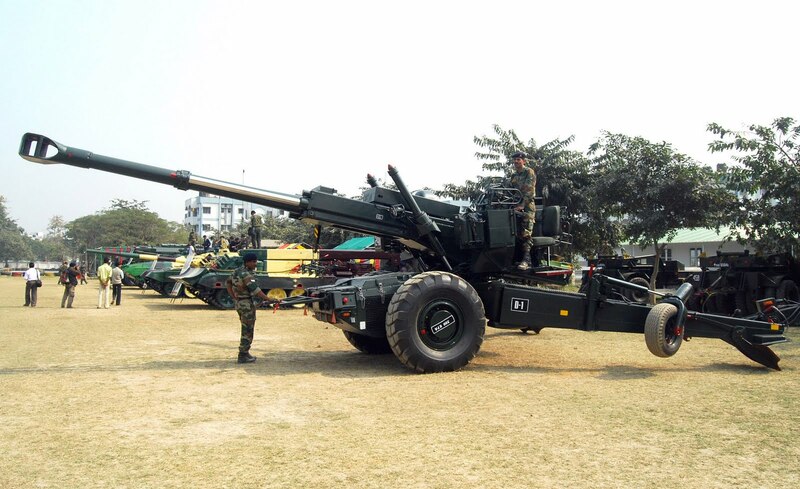 This two-day annual event showcases some of the latest and modern weapons currently in use by the Indian Army. 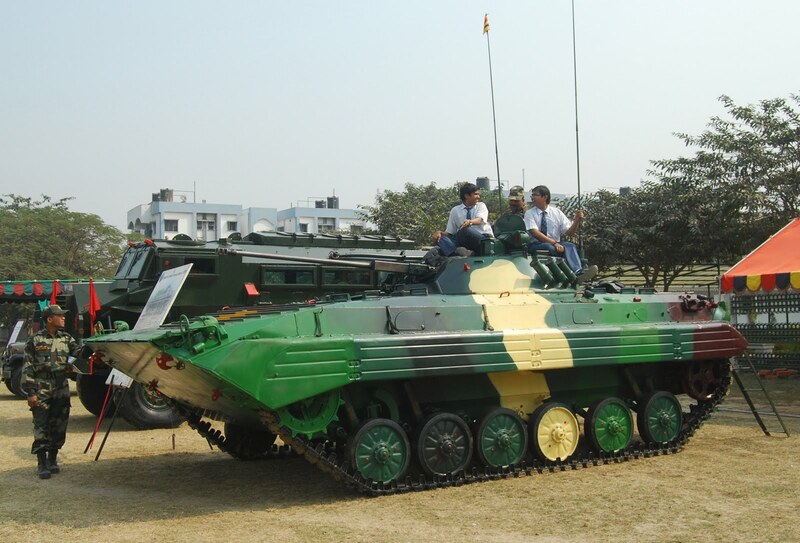 The weapons and equipment include T-72 Tank and BMP, 155 mm Bofors Gun, 105 mm Field guns, Anti Mine Vehicle, Mechanical Mine Layer, Nuclear, Biological and Chemical Equipment, Reconnaissance Boats, Mines and Explosive Detectors, Bomb Suits, Anti Tank Guided Missiles, Rifles, Rocket Launchers, Mortars, Night Vision Devices, Communication Systems. Literature on how to join the Defence Forces and Recruitment Promotional Material are also being displayed at the exhibition. Kolkata, 29 January : A Lufthansa flight from Frankfurt to Singapore with 300 passengers on board Saturday made an emergency landing at Kolkata airport following a medical complication related to a passenger. The passenger was found dead when the aircraft landed. "We facilitated the landing of the flight after we got a call for emergency landing. After the landing at about 11.25 am, it was discovered that a passenger, Robert, was already dead," said B.P. Sharma, director of the Netaji Subhash Chandra Bose International Airport. "Robert, 75, was travelling from Belgium along with his wife," he said. 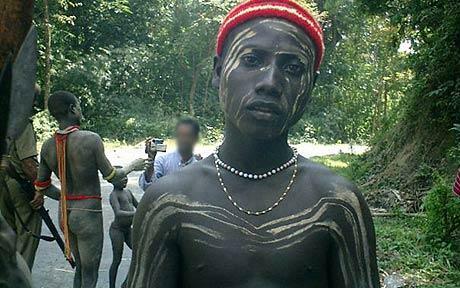 UNI, Tugapur, North Andaman, 29 January : Hundreds of villagers of North and Middle Andaman yesterday blocked Andaman's lone highway, Andaman Trunk Road, at Tugapur village to stage their second road blockade this month against the Jarawa Buffer Zone Notification of local administration. 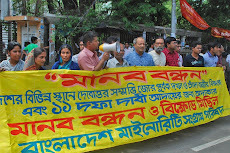 Nearly 450 villagers, who gathered under the banner of Andaman Trunk Road (ATR) and Buffer Zone Sangarsh Committee staged the blockade for two hours in the morning demanding immediate withdrawal of Buffer Zone Notification. 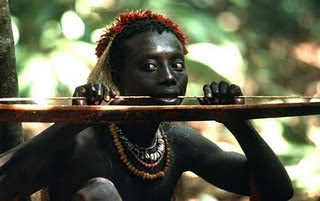 The buffer zone is a five-km radius around the Jarawa Reserve Forest of Andaman and Nicobar Islands, which was created by Andaman and Nicobar Administration in 2007 prohibiting entry of any person other than a member of original tribes for any commercial or tourism activity. The villagers, who also fear closure of Andaman Trunk Road due to the notification, were also demanding continuation of traffic on the vital link. 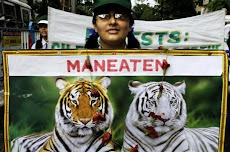 ''The Buffer Zone Notification, which is threatening existence of 34 villages of South Andaman and N and M Andaman District, must be withdrawn. This Notification is anti-public, anti-tourism and anti- fisheries industry,'' the Island's lone MP Bishnu Pada Ray, who also participated in the blockade, told UNI. Par panel wants Govt. to track "Black money" used for "terror"
PTI, New Delhi, 28 January : An Indian parliamentary panel has asked top officials of the Finance Ministry track the trail of black money used to fund acts of terror in the country. The Parliamentary Standing Committee on Finance also wanted the ministry to give clarification on the necessity to have a non-disclosure clause in the international treaties regarding exchange of banking information with various countries. The panel, headed by BJP leader Yashwant Sinha, wanted the finance ministry and the Directorate of Revenue Intelligence to evaluate the quantum of black money stashed in foreign banks and ascertain how much has been routed back to the country through FDI channels from small island nations. Revenue Secretary Sunil Mitra, Central Board for Direct Taxes (CBDT) Chairman Sudhir Chandra and Enforcement Directorate Director Arun Mathur were among the officials who appeared as witness before the Committee yesterday. BSS, London, 28 January : A group of senior Oxford University students today have met Bangladesh Prime Minister Sheikh Hasina at her hotel suite here for an academic discourse on comparative political systems and culture of Bangladesh and Britain. Officials familiar with the meeting last night told BSS that the inquisitive final year students of the premier British university also took keen interests in Bangladesh's contemporary history and culture and Sheikh Hasina's own political background. "A twenty-one year old law student Rachel wanted to know from the premier about her personal tragedy in 1975," an official familiar with the discussion said. 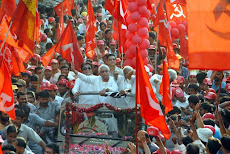 He said Sheikh Hasina gave a brief description on how and under what situation she had to join politics to lead her Awami League and spearhead a pro-democracy campaign to restore the rule of law after the assassination of her father Bangabandhu Sheikh Mujibur Rahman, mother, three brothers and two sisters-in-law. 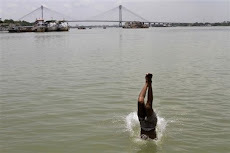 Kolkata, 28 January : Four people were killed and two hospitalized early Friday after allegedly consuming poisonous liquor near Kolkata’s satellite township of Salt Lake. The incident happened in the Dattabad area of North 24 Paraganas district. ‘According to information received by us, four people died and two were hospitalised. This unfortunate incident happened after they consumed poisonous liquor,’ said Sujit Bose, MLA, Belgachia East. 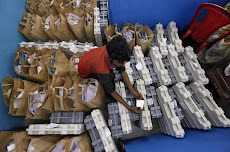 The Salt Lake area falls under the Belgachia East constituency. A senior district police official confirmed that three people have died so far but didn’t give the reason. 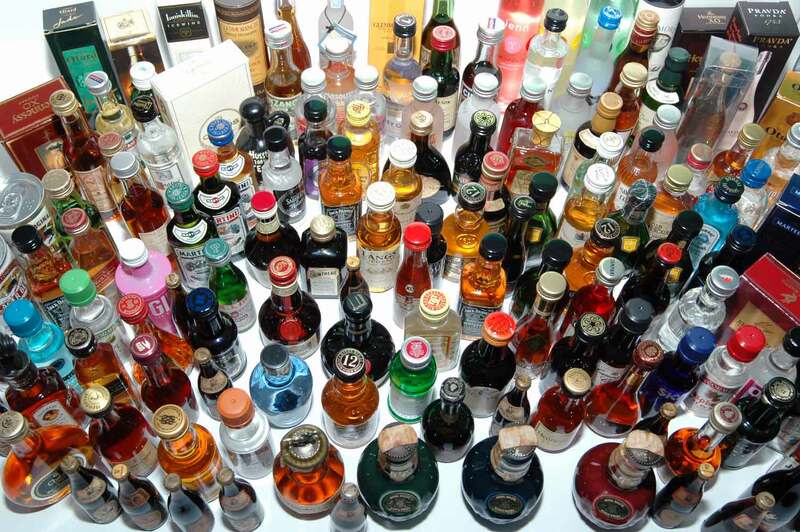 ‘It is still not known whether this incident happened due to intake of poisonous liquor because till now we have not received any feedback from the hospitals claiming the death to be unnatural,’ the official said on the condition of anonymity. BSS, Hili, Dinajpur, 28 January : Special Director General (DG) of Indian Border Security Force (BSF) Pronoy Sahay said here today that members of the Indian paramilitary force have been directed to stop killing on Bangladesh-India border. "We would solve the border problems through discussions by maintaining friendly relations with each other," he told reporters after a high-level meeting between Border Guard Bangladesh (BGB) and the BSF at Hili Land Port. Kolkata, 28 January : Nepal President Ram Baran Yadab, who is currently in India on a ten-day state visit, on Friday, recounted the fond memories of his association with Kolkata during his student days. Inaugurating the 177th Foundation Day celebrations of Medical College, Kolkata, of which he is an alumnus, President Yadab said: "Medical College Kolkata is my alma mater where I studied 43 years ago and it is this place which made me what I am today. "At a time when we had few qualified doctors in Nepal, it was a matter of pride for me to be imparted medical education in this great institute of learning," he added. 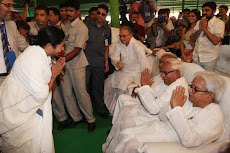 West Bengal Chief Minister Buddhadeb Bhattacharjee and other ministers of his cabinet were also present at the function. 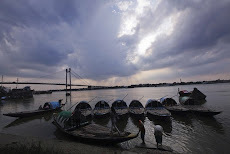 Kolkata, 28 January : On account of the very successful implementation of the Asian Development Bank (ADB) funded US$ 250 million power transmission & distribution upgradation project in Assam, ADB has agreed to give the state a second tranche of funding, according to Assam's Power, Public Enterprises, Industry & Commerce Minister P Bordoloi. He stated this while inaugurating the 3rd Eastern Region Summit - Potential North East organised by the Indian Electrical & Electronics Manufacturers’ Association (IEEMA) at Guwahati today. Bordoloi also mentioned that Assam was in advanced stage of negotiations with the World Bank for an assistance of US$ 400 million for the power sector in the state. Earlier, IEEMA President, Vimal Mahendru highlighted the pivotal role being played by IEEMA in meeting the challenge of providing electricity for all in the country. BSS, Dhaka, 28 January : Bangladesh government has decided to provide necessary assistance to businessmen for exporting surplus potato. The decision was taken at a meeting in the conference room of the Ministry of Commerce here today with its minister Lt Col (retd) Faruque Khan in the chair, an official release said. Commerce Secretary Md Golam Hossain, Vice-Chairman of Export Promotion Bureau (EPB) Jalal Ahmed, Chairman of Bangladesh Cold Storage Association Major (retd) Jasim Uddin and officials and leaders of concerned organizations, among others, attended the meeting. 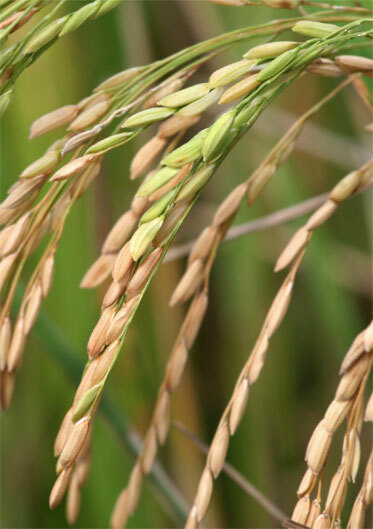 The meeting recommended to provide 20 percent cash assistance and extension of time limit of potato export. It is expected that potato production will be crossed one crore tonnes this year against the target of 84 lakh tonnes, the release added. The meeting was informed that about 90 lakh metric tons potato were produced in last fiscal against the target of 84 lakh tonnes. 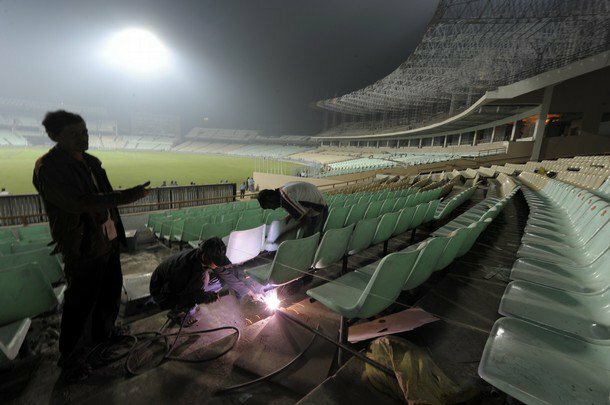 Kolkata, New Delhi, 27 January : The International Cricket Council Thursday scrapped Kolkata's Eden Gardens as a venue for the India-England match slated for 27 February in the World Cup due to the stadium's unpreparedness. A venue inspection team comprising tournament director Ratnakar Shetty, members of the Central Organising Committe (COC) and the ICC reported on the readiness of five outstanding venues after visiting the facilities. The team inspected Eden Gardens Tuesday. 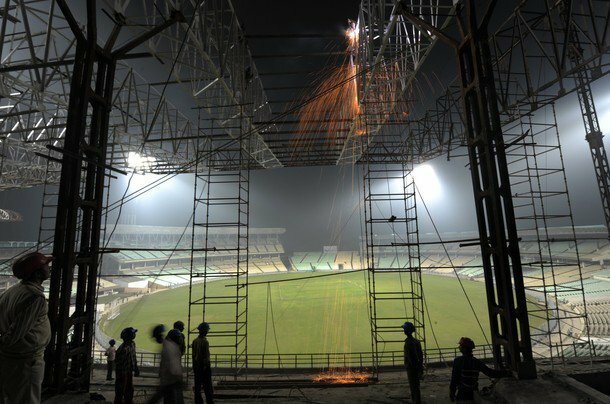 "The experts report, however, determined that Eden Gardens in Kolkata would not be ready within an acceptable time frame to host the India vs England ICC Cricket World Cup match on 27 February" ICC said in a statement. 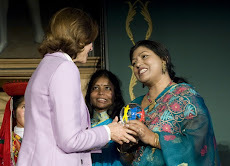 BSS, London, 27 January : Bangladesh Prime Minister Sheikh Hasina today called the constant growth of the trillion dollar weapon industry as a "cruel injustice" for mankind as she reiterated Bangladesh's unflinching commitment to the global peace at a high-profile academic discourse here. 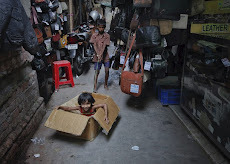 "This is a tragedy when teeming millions living in abject poverty in developing countries could benefit from even a marginal reduction in the size and cost of this destructive industry," she told an Oxford Union discourse on "Global Peace". As a matter of fact, she said, the more the nations "spend on arms, the less we have, for poverty reduction, human development, and empowerment of the poor." She said the growth of the industry to produce the lethal weapons was "a cruel injustice which is creating unrest, violence and terrorism around the world" while the big worry for all now was the dangerous possibility of exposure of the stockpiled weapons of mass destruction to terrorists. 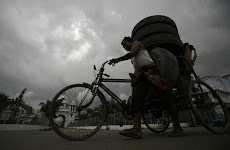 The Bangladesh premier said the worst exposure of the least developed nations including Bangladesh to climate change vulnerability for lavish lifestyle in the developed world was another example of "injustice". 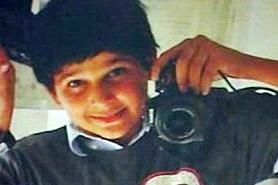 "This generated a sense of injustice which is an ideal situation for breeding terrorism. Indeed, there could be other causes hindering peace but to me it is the neglect of justice, which predominantly hampers peace," she said. 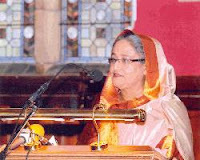 Sheikh Hasina urged nations and individuals to join hands against injustice and exploitation saying "all nations and individuals have to combine energies and relentless crusade against all prejudice, injustice and exploitation to own a world of peace and prosperity". Sheikh Hasina said Bangladesh's commitment to global peace was exemplified in its positions in all international organizations and in its outstanding role as the number one troops contributing country to UN Peace Keeping Missions. Scholars, faculty members and students of Oxford University joined the discourse of the Oxford Union, founded in 1823 as Britain's second oldest debating society that earned a worldwide repute by providing a valuable training ground for politicians across the world. IANS, Kolkata, 27 January : The knives were out for Cricket Association of Bengal (CAB) president Jagmohan Dalmiya Thursday, with the International Cricket Council (ICC) ruling out Eden Gardens as the venue for the 27 Feb India-England match of the World Cup. A staunch Dalmiya opponent demanded his resignation from the post of CAB president. ANI, New Delhi, 27 January : The Cabinet Committee on Economic Affairs (CCEA) on Thursday approved a plan to set up a 100 megawatt gas-based power project in Tripura. The government has sanctioned Rs. 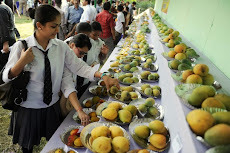 623.44 crore for the project, which is expected to be commissioned by July 2013. This includes interest amount of Rs. 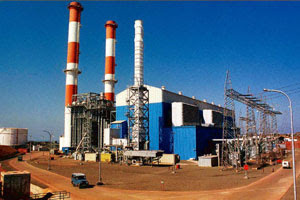 51.09 crore during construction at November 2009 price level. 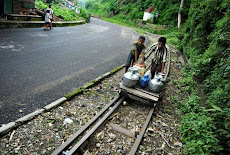 The project will be completed with a debt-equity ratio of 70:30. While the equity portion shall be met through NEEPCO’s internal resources, the debt portion shall be arranged through Commercial Borrowings. 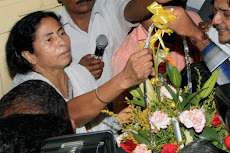 The power generated from the project will be supplied to Tripura. The project would contribute to the economic development of the State by providing 100 MW power and direct and indirect employment to the local population. Being a combined cycle power station by using natural gas, the plant shall be of high efficiency and also environmentally compatible project, with negligible emission. This project will mitigate the problem of power shortage in the NER and the consequent need for import of power particularly during the winter seasons. The project will improve the hydro-thermal mix in the NER and the Country. PTI, New Delhi, 26 January : India's prominent artistes like Girish Karnad, Naseeruddin Shah, Aparna Sen and Sharmila Tagore have written to Prime Minister Manmohan Singh seeking the release of activist Dr Binayak Sen.
"Sentencing Dr Sen to imprisonment is unfair, too extreme and undermines the credibility of our police and judiciary. To arrest a citizen of India on false charges and subject him to years of custody and legal wrangles is to make a mockery of justice and democracy," they wrote in the letter. 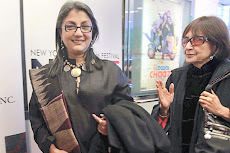 Mahesh Bhatt, Rahul Bose and filmmaker Goutam Ghosh are the other names who support the appeal. Sen, 61, was convicted and sentenced to life imprisonment on sedition charges by the Additional District and Sessions Court at Raipur last month. 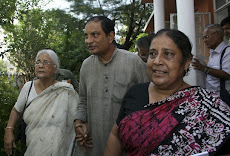 Sen was arrested in May 2007 on suspected links with Maoist leader Narayan Sanyal. He was jailed for two years before the Supreme Court granted him bail in 2009. 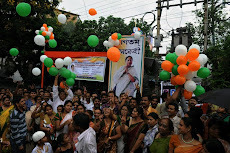 Kolkata, 26 January : West Bengal today joined the nation in celebrate the 62nd Republic Day with much fanfare amid tight securiting arrangements. 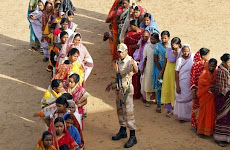 The Republic Day parade was held at Red Road in the heart of the city amid beefed up security arrangements. 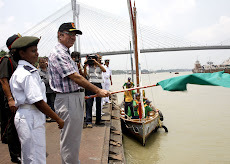 The Tricolour was unfurled by Governor M K Narayanan in presence of Chief Minister Buddhadeb Bhattacharjee and a host of dignitaries. 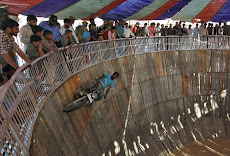 Spectators witnessed a grand display of weaponry. Army band musicians also took part in the parade. All the 21 entry and exist points of the city were kept under strict vigilance to prevent entry of outsiders from yesterday, police said. Additional police personnel had been deployed at all important public places like railway stations, car parking lots, bus terminuses and shopping malls, the sources added. Passengers were being frisked at the Howrah station, with the Railway Protection Force deploying sniffer dogs, police added. Netaji Subhash Chandra Bose International Airport Director B P Sharma today hoisted the Tricolour in front of the international terminal building. The director took the salute at a march past by the CISF and personnel of the Airport Authority of India's fire brigade. 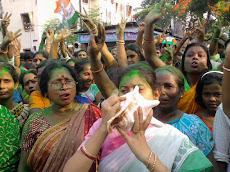 The day was also celebrated at the Kidderpore Dock Premises of the Kolkata Port Trust. 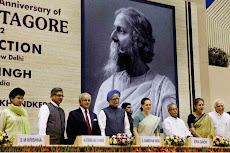 PTI, New Delhi, 26 January : The 150th birth anniversary of Rabindranath Tagore was on focus during the Indian Republic Day parade here today, with two separate tableaux paying tribute to the Nobel laureate poet. 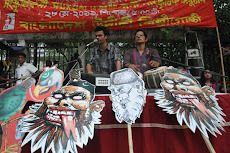 The tunes and lyrics of 'Rabindra sangeet' reverberated in the air over the majestic Rajpath twice -- the chosen songs being 'Ekla chalo re' (if they answer not to your call, walk alone) and 'Oi mahamanaba ashe' (Cometh the great man). 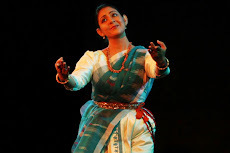 The tableau on 'Gurudev' by the Culture Ministry and Sangeet Natak Akademi was the first to be rolled out among the cultural displays from states and ministries. UNB, Keraniganj, 26 January : Traffic movement on Dhaka-Mawa and Nawabganj-Dohar highways came to a halt for several hours on Wednesday as local people blocked the highways protesting the government move to build an airport at Arail Beel. The government earlier decided to build Bangabandhu International Airport at Arial Beel, which encompasses part of areas of Nawabganj and Dohar upazilas of Dhaka district and Srinagar upazila of Munshiganj district. 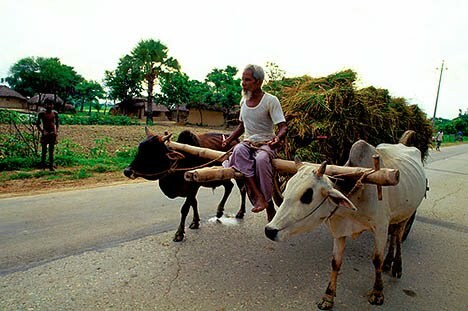 Local people said that construction of the airport at Arail Beel would affect their crop land and dwelling places. 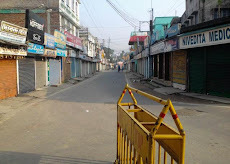 IANS, Guwahati, 26 January : People in North-east India defied calls by separatist rebels to boycott Republic Day and joined the celebrations across the region amid a strike called by the militants Wednesday, officials said. 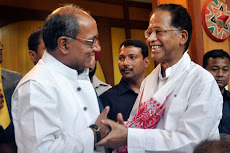 "It is heartening to find people coming to attend the Republic Day functions across the region despite calls by some militants to boycott the celebrations," Assam Chief Minister Tarun Gogoi said here. 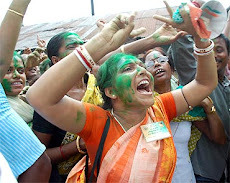 At least six outlawed rebel groups, including the powerful United Liberation Front of Asom (ULFA), called a 17-hour general strike from 1 am to protest the celebrations marking India's transition to a Republic in 1950. 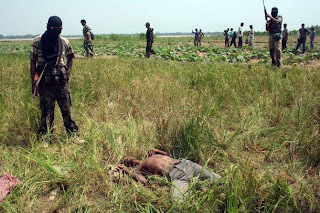 Jhargram, 26 January : Decomposed bodies of two CPI(M) workers, suspected to have been killed by Maoists, were today recovered from this Maoist-hit area in West Midnapore district, police said. 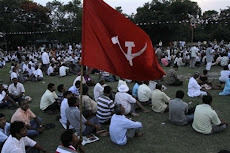 The middle-aged CPI(M) party workers were missing since 15 January after which their bodies were located by the villagers in Manickpara. The bodies bore bullet marks and physical injury. UNI, Agartala, 26 January : Tripura government has brought a neurosurgeon from Kolkata this morning for treatment of Agartala Municipal Council (AMC) Chairman and eminent lawyer of the state Shankar Das. Officials here said that Das had suffered a massive heart attack last evening. He had been shifted to Intensive Care Unit (ICU) of Agartala Government Medical College (AGMC) where doctors stated his condition to be critical. Tripura Chief Minister Manik Sarkar along with other top party leaders visited him in the hospital. 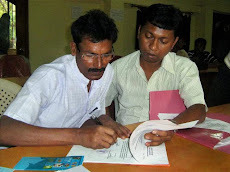 The state government has constituted a six-member committee for Shankar Babu's treatment. 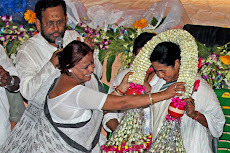 Health Minister Tapan Chakraborty told reporters that the department has been asked to take all necessary steps for his treatment and the Chief Minister personally spoke to West Bengal Health Minister Dr Surya Kanta Mishra over sending the neurosurgeon here. 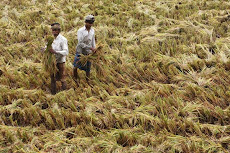 UNB, Dhaka, 26 January : Bangladesh’s agriculture sector faces Tk 30,000 crore loss per year in the post-harvest period for lack of proper transportation management, premature harvesting and improper product handling. This is the area where Dutch cooperation can play a role to a give a boost to the potential agro and food processing sector, which is an important manufacturing industry in Bangladesh in terms of employment and value addition, said the speakers at a business seminar on Wednesday. The seminar titled ‘Agro-Processing Industries in Bangladesh: Possible Dutch Cooperation’ was held at Sonargaon Hotel on Wednesday. Commerce Minister Faruk Khan was the chief guest while Netherlands Ambassador in Dhaka Alphons Hennekens the special guest at the seminar arranged by Dutch-Bangla Chamber of Commerce and Industry (DBCCI) with its president M Imam Hossain in the chair. Post Harvest and Quality Assurance expert Dr M Saleh Ahmed presented the keynote paper in the seminar. DBCCI secretary general Seemab Rasheed and members of its board of directors were present. In his keynote paper, Dr Saleh Ahmed said Bangladesh has tremendous potential to increase production of selected high value agro-commodities and create a sufficient export surplus though country’s agriculture sector face Tk 30,000 crore annual loss due to lack of proper transportation management, and improper handling of products and immature harvesting. Addressing the seminar, Commerce Minister Faruk Khan said he would immediately sit with the officials of Export Promotion Bureau (EPB), Commerce Secretary and other stakeholders to take pragmatic decisions for promoting the sector and overcoming all challenges faced by it. “We’ll soon form a committee in this regard. We want to work together to move forward,” he said inviting Dr M Saleh Ahmed in the committee. He said approximately 2,000 megawatt of electricity was added to the national grid over the last two years and hopefully another 1,000 megawatt will be added within this year. PTI, New Delhi, 25 January : Unfazed by opposition attacks and questions from Supreme Court, India Government today maintained that it cannot disclose information received from foreign entities on black money held by Indians abroad because of absence of legal framework. 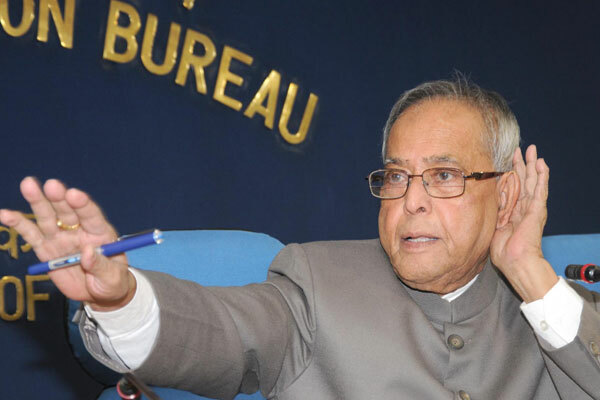 Finance Minister Pranab Mukherjee, however, dismissed opposition criticism that it was not disclosing information because such disclosure could result in the government's fall. "Let us understand the issue. 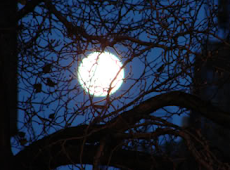 No information can be made available unless there is a legal framework. No sovereign country is going to share information unless there is a legal framework," he told a press conference explaining the reasons why the government was not in a position to part with information it has obtained some foreign entities on black money stashed away abroad. 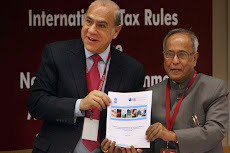 Kolkata, 25 January : The 35th edition of the annual Kolkata International Book Fair, the largest of its kind in the country, got underway today in the presence of award winning author Richard Ford and US Ambassador Timothy J Roemer. Ford, a Pulitzer Prize-winning novelist from America, inaugurated the 12-day fair with a wooden plaque as Roemer looked on. 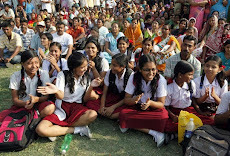 West Bengal Chief Minister Buddhadeb Bhattacharjee, also present on the occasion, said it was a rare opportunity for residents of the city to buy books on science, sociology and US literature at the fair, with the principal theme of 'America', this year. IANS, Dhaka, 25 January : The Bangladesh government Tuesday formed a three-member committee to probe into the causes behind the collapse of its stock markets twice in this month. 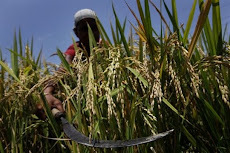 The committee headed by Khondkar Ibrahim Khaled, chairman of the Bangladesh Krishi Bank and former deputy governor of the Bangladesh Bank, was announced by Finance Minister A.M.A. 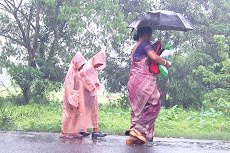 Muhith. Names of the other two members and terms of reference of the committee will be announced Wednesday, The Daily Star reported. "The committee was formed hurriedly on Tuesday with the approval of the prime minister as she will leave the country in the evening for a five-day visit to Britain," said Muhith. Sheikh Hasina left for London on a six-day visit earlier in the day. The two stock market crashes, that brought investors to the streets, fighting pitched battles with the police, are widely believed to be the caused by individual operators and firms with links with the opposition, a speculation that has been denied by the government. The Securities and Exchange Commission (SEC) suspended six parties last week, and the High Court Tuesday upheld the SEC's action. A bench of Justice A.H.M. Shamsuddin Chowdhury Manik and Justice Sheikh Mohammed Zakir Hossain rejected writ petitions filed by five stockbrokers - Dhaka Bank Securities, NCC Bank Brokerage, PFI Securities, Alliance Securities and Management and IIDFC Securities. 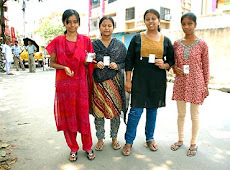 Kolkata, 25 January : Electors Photo Identity Cards (EPICs) have been given to as many as 96 per cent of voters in the poll-bound West Bengal, a top election official said here today. 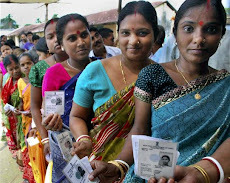 At a function to observe the first 'National Voters' Day', state Chief Electoral Officer Sunil Gupta said though the voters' list had been released, additions can be made to it before election to include those whose name was left out. 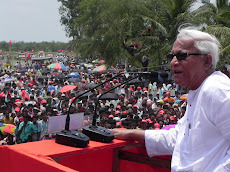 UNI, Agartala, 25 January : Leader of the Opposition Ratan Lal Nath today criticised Chief Minister Manik Sarkar for demanding a CAG audit on state finance and proclamation of financial emergency in Tripura. 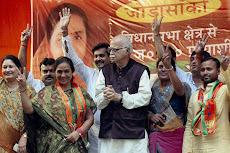 Addressing the media here, Nath said the Left Front government was reeling under a financial crisis and that the state had a debt burden of Rs 5,311 crore now. 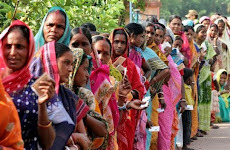 ''The Centre has been allocating huge funds for the development of the state but a good amount of money has been diverted to party funds. 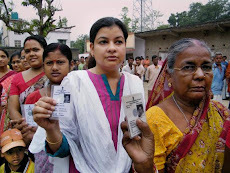 Rs 270 crore have been sent to Politburo since 2008 so far,'' Nath said, adding that the party leaders were worried about the future of comrades in Tripura who had already started taking shelter here from West Bengal. Kolkata, 25 January : Night-time movements along the Guwahati-Lumding section of North East Frontier Railway in Assam have been suspended till 30 January to prevent any possible subversive activity in view of Republic Day Wednesday, a railway release said. 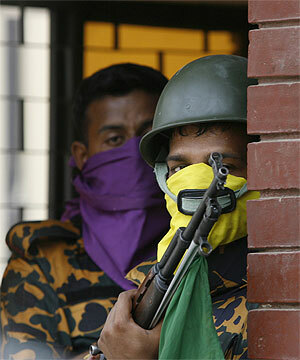 Intelligence sources said there were inputs about threats from different militant groups, including the United Liberation Front of Asom (ULFA). In a media release, the railways Tuesday said night running of mail/express trains in the entire Assam portion of North East Frontier Railway has been suspended between 5 pm and 5 am The restriction implemented on 24 Jan evening. Home minister holds meeting with GJM on "Gorkhaland"
PTI, New Delhi, 25 January : Indian Home minister P Chidambaram today held a meeting with the Gorkha Janmukti Morcha (GJM) on the demand for statehood to Gorkhaland and is understood to have deliberated on setting up of a regional authority for Gorkhas in Darjeeling. 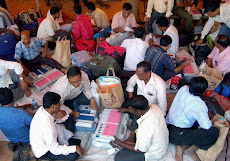 "We had a detailed discussion on our demand with the home minister. The meeting was held in a cordial atmosphere and was very positive," GJM general secretary Roshan Giri told reporters after the hour-long meeting. Giri refused to divulge what transpired, but said the Central government should clear its stand on GJM's demand. 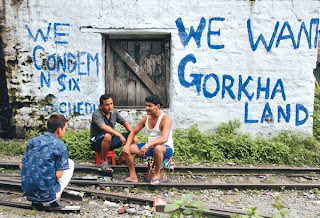 Sources said the meeting deliberated on the possibility of setting up of the proposed Darjeeling regional authority comprising the districts of Darjeeling and adjoining areas but no decision has been taken. 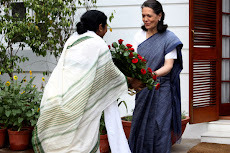 However, it was not clear whether the interim authority would be set up before the West Bengal assembly elections a few months away. 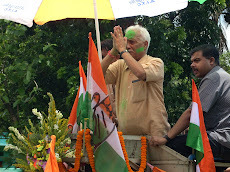 BJP leader and Darjeeling MP Jaswant Singh was part of the delegation. During the last tripartite political level talks, key issues, including territorial jurisdiction, were sorted out. 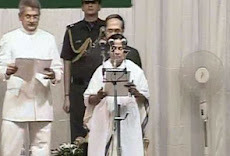 The Central and West Bengal governments have earlier worked on the subjects and departments which are expected to be handed over to the interim authority. 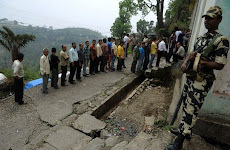 Sources said both Central and West Bengal governments favoured limiting the proposed authority to just the hill sub-divisions of Darjeeling, Kurseong and Kalimpong. 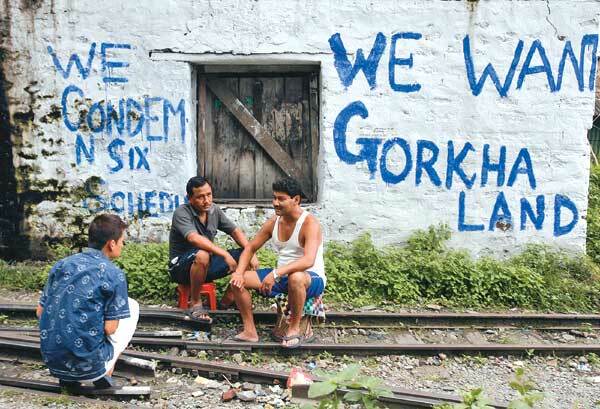 Since its inception in 2007, the GJM has been demanding a separate Gorkhaland state that includes the Siliguri sub-division of Darjeeling district in the plains and contiguous areas in neighbouring Jalpaiguri district. 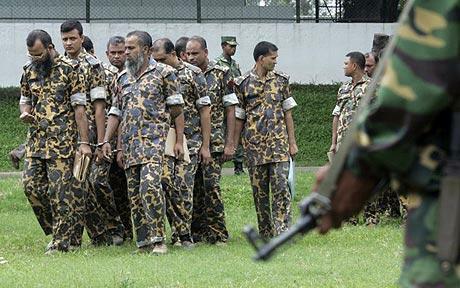 UNB, Naogaon, 24 January : A special court here Monday sentenced 25 BDR men of 43 Rifles Battalion to various terms of imprisonment ranging from four months to seven years for their involvement in BDR mutiny. 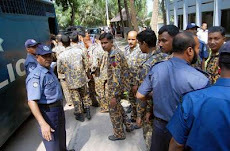 The Special Court-12, headed by Rajshahi Sector Commander Col Ehia Azam Khan, also fined them Tk 100 each. 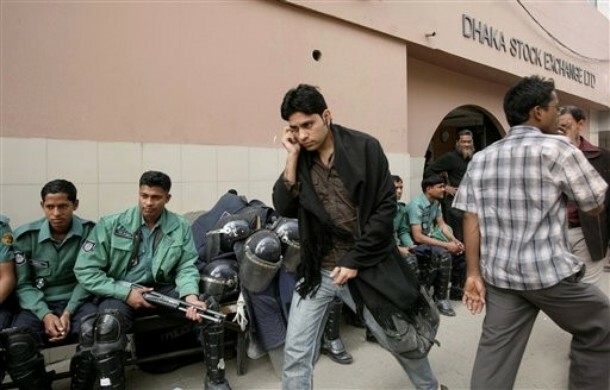 The convicts are: subedar major Khalid Hossain, nayek subedar Shaikh Atiar Ali, lance nayeks Rezaul Karim, Aminuzzaman and Akram Hossain Biswas, nayeks Shaikh Farid Hossain and Hedayet Ali, sepoys Alim Al Fuad, Fayez Ahmed, Munshi Nazmul Haque, Masum Billah, Motiar Rahman, Biplob Hossain, Ariful Islam, Nur Mohammad, Khondakar Mamun Hossain, Shahinur Alam, Moshtak Ali, Kohinur Islam, Jabed Younus, Iqbal Hossain, Moshiur Rahman, Mehdi Hasan, Najmul Haq, Jamal Hossain and Shahidul Islam. Deputy Attorney General Sri Sasanka Shekhar, two other members of the special court are Lt Col Gazi Mohammad Khalid Hossain and Lt Commander (BN) Muhammad Touhidul Islam were present, among others, when the verdict was delivered. 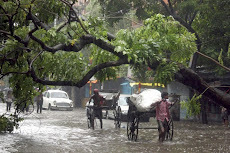 Kolkata, 24 January : The West Bengal government today ordered arrest of the owner of the cold storage where an ammonia gas leakage affected nearly 3,000 people in Nager Bazar area here. 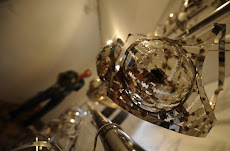 "Many names came up as the owner of the cold storage. 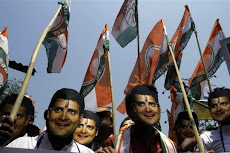 But we have found that the actual owner is Kishore Sambani. I have ordered his arrest. We will have to see that he is not released on bail once he is arrested," state Fire Services Minister Pratim Chatterjee told newsmen. 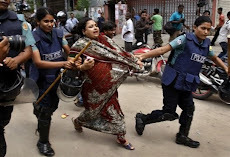 UNB, Satkhira, 24 January : Fifty-nine Indian nationals, including women, have been languishing in the district jail long after completion of their prison term. 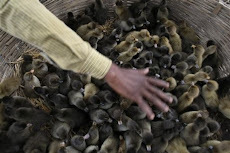 They were held by members of Bangladesh Rifles, Coast Guard and police either on charge of trespassing or smuggling in separate drives at different places of the country several years ago. 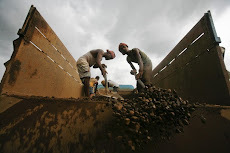 They were convicted and sentenced to suffer rigorous imprisonment on various terms by the concerned courts. Later the authorities sent them to Satkhira jail from different districts. Trapped in trick of law they are leading inhuman life in the prison even years after expiry of their jail term. 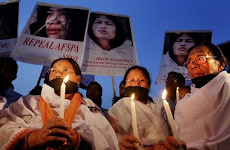 Jail authorities attempted several times to hand them over to concerned authority in India after expiry of their term but the Indian authorities refused to take them back without showing any reason on several occasions. 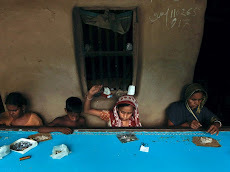 The Indian nationals are: Mantu Pramanik, 33, Ashraf Sheikh, 45, Shabbir Rahman, 35, Shahjahan Ali Molla, 35, Binoy Kumar Pandit, 35, Chandan Das, 46, Bijoy, 42, Ashrafuzzaman Sharif, 44, Shyamsundar Saha, 42, Jomrathi Mia, 60, Shri Bijoy Raja, 40, Ramchandra Mahatman, 35, Sri Chandip, alias Sandip, 30, Reva Tampa, 39, Sri Ramjee, 35, Mohammad Mokku, 35, Asadul Haq, 33, Sri Uday Malo, 33, Mohammad Zakir, 27, Nazir Hossain, 32, Anjali Devi alias Manju, 40, Sri Bijoy Kumar, 34, Smriti Mandal, 40, Bappu Mandal, 38, Sri Madan Karmakar, 35, Bhaskari Neyeki, 32, Nazrul Mandal, 33, Yakub Ali Khan, 30, Mantu Chang, 38, Boddi, 45, Maharu Kalasingji, 28, Sri Harmaji Pandi, 38, Mohammad Rojario, 70, Sriram Milon alias Rami Milon, 50, Sri Ramsingar, 35, Zinkao, 37, Ashik Sheikh, 27, Mohadev Ghosh, 60, Noresh Chengshi, 40, Sombori Wang alias Shambhu, 28, Sri Ganesh Goswami, 35, Sufal Kanti Mandal, 45, Major, 35, Jinnah, 36, Rajpaul, 33, Ajit, 44, Kanna Pahe, 44, Rajkumar, 24, Sohrab, 70, Shariful Islam, 38, Sanyasi Das, 36, and Chunna Singh, 50. PTI, Port Blair, 24 January : Commercial operation of the country's first seaplane - Jal Hans - began today at Port Blair in Andaman and Nicobar Islands. 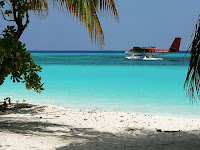 Inaugurated by Lt Governor Bhopinder Singh, the seaplane took its first trip to Havelock Island in the Andamans. "The Jal Hans will help to promote tourism in Havelock Island, which is gaining popularity as the most sought-after tourist destination," Singh said. 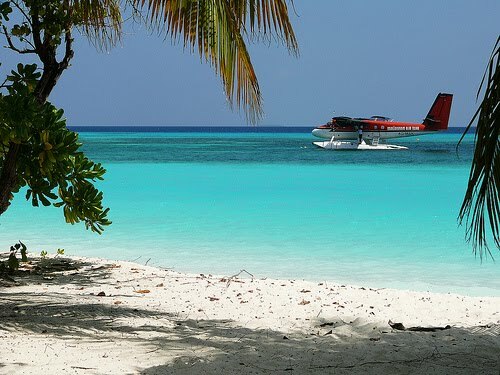 "The seaplane service, a joint venture between the public sector Pawan Hans Helicopters Limited and Andaman and Nicobar administration, will connect Port Blair with Havelock," director of tourism Binay Bhusan said, adding that it has a seating capacity of nine people and a speed of 280 km/hour. Its services will later be extended to other parts of the islands, he said. Kolkata, 24 January : Indian football icon Bhaichung Bhutia today batted for IPL discard Sourav Ganguly, saying that his age cannot be a factor for being overlooked in the Indian Premier League auction. 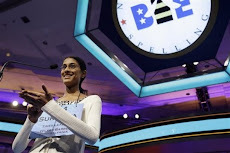 "Age cannot determine how long a player can play. It should always be performance oriented," Bhutia said when asked to react on Ganguly's exit from IPL IV after he found no takers in the players' auction. 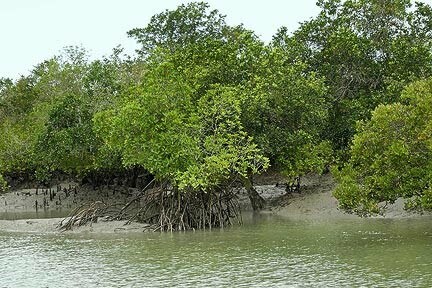 UNB, Dhaka, 24 January : Bangladesh Prime Minister Sheikh Hasina has asked the government’s ministries and departments to give their best efforts to saving the flora and fauna of the Sundarbans, the largest mangrove forest in the world. Prime Minister gave the directive while chairing the 99th cabinet meeting at the Bangladesh Secretariat on Monday. 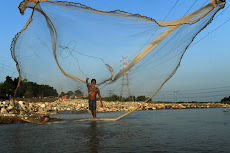 Briefing newsmen at the PID conference room, Press Secretary to the PM Abul Kalam Azad said a proposal was made at the cabinet meeting to collect Garan wood from the Sundarbans to supply materials for Khulna Hardboard Mills Ltd. 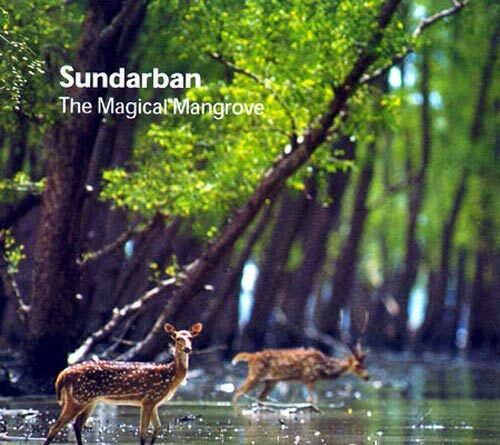 The Prime Minister categorically told the meeting that Garan wood must not be collected from the Sundarbans. At the same time, the Prime Minister also directed the authorities concerned not to close the hardboard mill under any circumstances. “The mill will have to be kept operational at any cost for sake of employees and workers of the mill,” the Prime Minister was quoted as saying by the Pres Secretary. Regarding necessary materials to operate the hardboard mill, the Prime Minister asked the authorities concerned for collecting all materials from the market, Azad said. 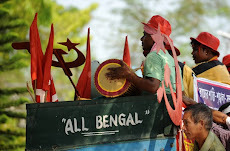 Kolkata, 23 January : Three CPI(M) members, including a local-level leader, were killed and one injured by Maoists in Salboni are in West Midnapore district today. 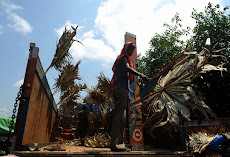 Police said a group of Maoists appeared suddenly and fired from close range at four persons having tea at a stall this morning at Maturapur village. While three of them died on the spot, the third person was injured seriously and was rushed to Midnapore Medical College and Hospital. 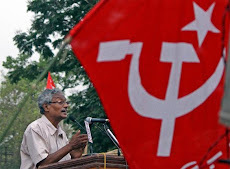 The killed CPI(M) leader was identified as Karamchand Mahto, a local CPI(M) leader, and the injured as Sambhunath Samanta, a resident of Anadapur village in Keshpur area, the police said. There was a mine blast at a distance from Maturapur after the firing. 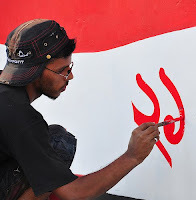 It is apprehended to be a handiwork of the attackers to divert the attention of the police while fleeing. 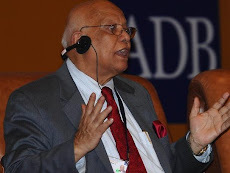 Reuters, Dhaka, 23 January : Bangladesh will probe the recent series of collapses in share prices that have triggered violent protest by investors and forced trading to halt, Finance Minister Abul Maal Abdul Muhith said on Sunday. Kolkata, 23 January : Ammonia gas leaked from a cold storage today at Dum Dum in the northern fringes of the metropolis, fire brigade officials said. Four fire tenders were trying to detect the leakage, they said, adding that efforts were being made to contact the owners of the facility. The storage was closed as it was a Sunday. There was no report of casualties as of now, the fire officials said. Guwahati, 23 January : The 'pro-talk' group of ULFA today demanded immediate suspension of its 'commander-in-chief' Paresh Barua for taking arbitrary decisions violating the outfit's discipline. 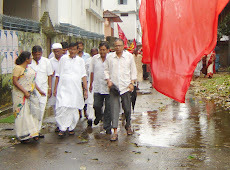 "At a time when the meeting of the ULFA executive committee and the general council are about to be held in the backdrop of the overwhelming desire of the people for talks, the recent announcement of Barua against the talks process is uncalled for," Mrinal Hazarika, a pro-talk ULFA leader, told reporters here. 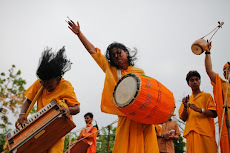 The recent video footage released by the outfit which shows the Barua celebrating Bihu amid slogans against talks, revealed the "true nature of the so called leader", he said. UNI, Imphal, 23 January : Six militant groups of Northeast have called general strike on the Republic Day and boycott the celebrations. 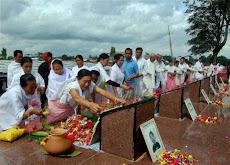 Kamatapur Liberation Organisation general secretary Kh Pambei, 'convenor' Manipur People's Liberation Front (MPLF) G Rifikhang, 'vice-president National Democratic Front of Boroland (NDFB), 'general secretary', National Liberation Front of Tripra and Tripura People's Democratic Front (TPDF) Poresh Baruah, CS and 'executive member' of United Liberation Front of Asom today said in a joint statement that the strike would begin at 0100 hours and ends at 1730 hrs. PTI, Raipur, 23 January : The Chhattisgarh High Court at Bilaspur shall hear a petition for the suspension of sentence and grant of bail of celebrated human rights activist and pediatrician Dr. Binayak Sen on Monday. 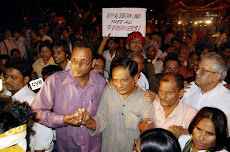 Exactly a month ago, on 24 December last year, Dr. Sen, Kolkata businessman Pijush Guha and alleged Maoist ideologue, Narayan Sanyal, were convicted of participating in a criminal conspiracy to commit sedition and sentenced to life imprisonment by the Additional District and Sessions Court at Raipur. PTI, New Delhi, 23 January : A proposal to exempt certain categories of people from visa requirement for travel within South Asia is expected to be one of the main issues along with initiatives to forge greater integration and end terror in the region at the upcoming SAARC meet in Thimphu. The SAARC Foreign Ministers' meeting in Thimphu on February 8 is also expected to take stock of various other initiatives, including economic integration, utilisation of the SAARC Development Fund and the Food Bank and formation of the South Asian Forum. The SAARC Visa Exemption Scheme is expected to be one of the major issues on the agenda of the meeting which would be attended by External Affairs Minister S M Krishna and his counterparts from other seven member nations, sources said here. 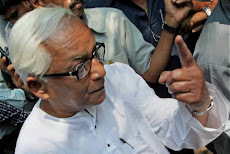 Kolkata, 23 January : West Bengal Chief Minister Buddhadeb Bhattacharjee today demanded action against a section of capitalists who have allegedly amassed over Rs 100 lakh crores of unaccounted money in foreign banks. 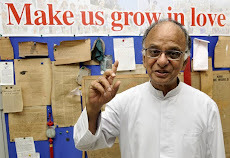 Bhattacharjee said that some rich people in the country had deposited in Swiss or German banks over Rs 100 lakh crores of black money, while a large section of people remained in poverty. "Who are they? We demand steps against them," he said at a function marking the 114th birth anniversary of Netaji Subhas Chandra Bose as 'Desh Prem Divas'. 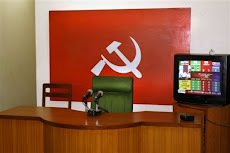 PTI, Imphal, 23 January : Seven activists of the Kangleipak Communist Party (Lalheiba group) were arrested and two pistols seized from them from Sagolband Moirang Leirak area in Imphal West district today, officials said. 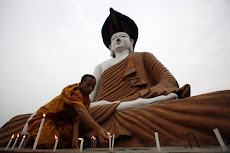 The seven activists of the KCP (Lalheiba group) were involved in the bomb blast at Telipati area on Friday last in Imphal East district, they said. 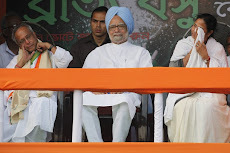 PTI, Kolkata, 23 January : Infosys founder N R Narayana Murthy on Sunday criticised the political leadership of the country for failing to show due respect to Netaji Subhas Chandra Bose and said it is “time this is corrected”. Had he been present at the post-Independent reconstruction era along with Nehru, Rajaji, Patel and Shyama Prasad Mookherjee, India’s destiny would have been different, he observed. 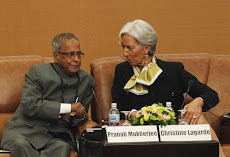 “India would have also done a much better job in terms of people management as he foresaw the negative impact of a burgeoning population on a country’s economy,” Murthy said. “Netaji had all the smartness to take India far from what it is now today,” he said and observed sarcastically that “nowadays, we talk loud even about very mediocre achievements”. 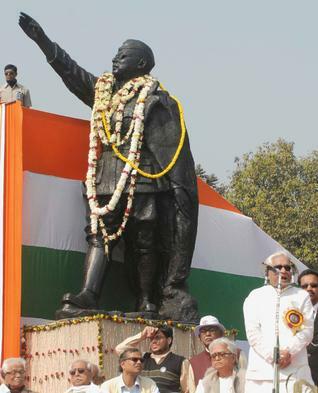 Shillong pays glowing tributes to "Subhash Chandra Bose"
PTI, Shillong, 23 January : The city paid rich tributes to Netaji Subhash Chandra Bose and slogans like 'Netaji Zindabad' and 'Vandemataram' filled the air on the 114th birth anniversary of the veteran freedom fighter today. 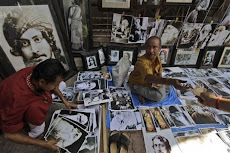 People held portraits of Netaji and took part in 'Prabhat Pheris' (morning processions). Floral tributes were paid at the Netaji Square at Jail Road, the Netaji statue at State Central Library premises and other parts of the city. Hoisting the National Flag in front of the Netaji statue, state Power Minister Abu Taher Mondal called upon the people, especially the youth to learn from the life of Netaji.